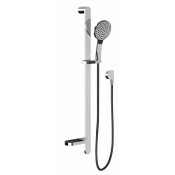 Founded on the principles of design, quality and customer service, Phoenix has been producing tapware, showers and bathroom accessories since 1989. Phoenix's Design Team's expertise in style, innovation and first-class engineering, have established our prominent position in the Australian bathroom industry. Phoenix's relentless focus on design and innovation ensures customers will always enjoy the best bathroom experience. Phoenix offer tailored design solutions and bespoke manufacturing services to customers globally. Phoenix's Australian design team have a collective 100 years’ experience in the design industry and have been recognised for their outstanding achievements throughout this time, most notably with 4 iF Product Design awards and 3 Red Dot Awards. There are many more Products by Phoenix available at your local Benton's Store.